Robert Masiello, West Point Thoroughbreds and Chris Larsen's Berned was able to hold off the late run of Dreamcall to win Sunday's Grade 3 Molly Pitcher Stakes by three-quarters of a length, giving jockey Joe Bravo his third win on the card. The 4-year-old daughter of Bernardini, trained by Graham Motion, covered 1 1/16 miles over Monmouth's fast main track in 1:44.52. Berned was the co-second choice at 4-1; 4-5 favorite Divine Miss Grey finished third. Divine Miss Grey was quick out of the gate to set solid early fractions of :23.51 and :46.80. Unchained Melody kept close company in second just a half-length behind, while both Berned and eventual runner-up Dreamcall were at the back of the field down the backstretch. Rounding the far turn, Unchained Melody took command from Divine Miss Grey, but both Berned and Dreamcall were eating up the ground from the rear of the field. Berned was awkward around the last park of the bend, but straightened out in the lane and stretched away to a four-length lead. Dreamcall came flying late but could only gain second, beaten three-quarters of a length by Berned. Divine Miss Grey regained third over Unchained Melody. Bred in Kentucky by AR Enterprises, Berned was a $550,000 yearling at the Keeneland September sale. She has won multiple listed stakes, but the Molly Pitcher is her first graded win. Overall, Berned's record stands at 5-2-1 from 15 starts, with earnings of over $370,000. 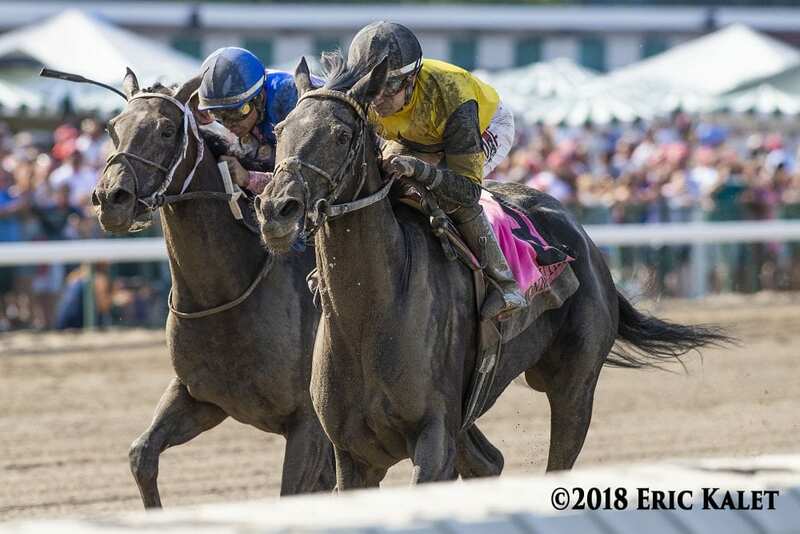 This entry was posted in Racing and tagged Bernardini, berned, divine miss grey, dreamcall, Graham Motion, joe bravo, Molly Pitcher, Molly Pitcher Stakes, Monmouth, monmouth park by Paulick Report Staff. Bookmark the permalink.